Late last night (and I mean late! ), I decided to have at it. 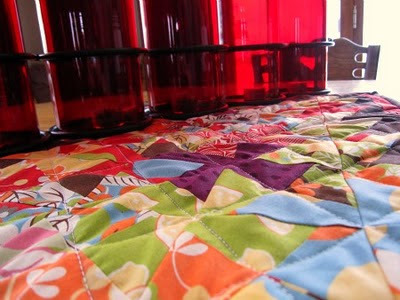 With just one charm pack of Freebird by MoMo for Moda and some Kona Cotton, I had an awesome table topper in no time. The whole technique is simple and amazing! I don't know why I hadn't tried this ruler earlier. On the table and ready to go. What do you think? Oooooh, I love this! Great work! I adore just about every Momo fabric line I've seen so far, the colors are just so bright and cheery. Great choice for a table topper! How fun. I have yet to try this whirly-gig design and really want to. When I saw that tutorial I thought it was a great idea. Yours turned out really cute. Yours is cute! I was debating buying myself a ruler to do it...now I need to. Super cute! This looks adorable. I am adding this on my to do list for next year. Thanks for the inspiration, and sorry about the typo in my last post. My mom has this ruler too and I MUST borrow it one of these days! Love this! Yay!!! So glad you liked mine (thanks!) and that your mom had the ruler for you ready to go!! I love how yours turned out, uber cute. 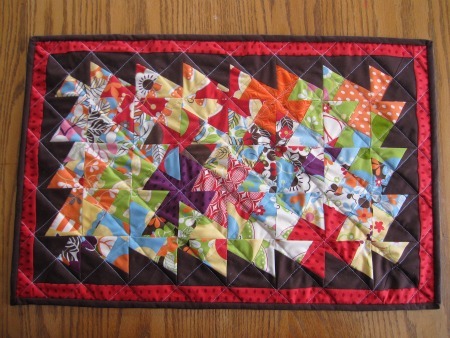 I just finished a quilt using the larger ruler...posting that sometime next year! :) Thanks for linking up!